Hess, McKenna, Zimmermann, Hall set to attend 2019 edition. 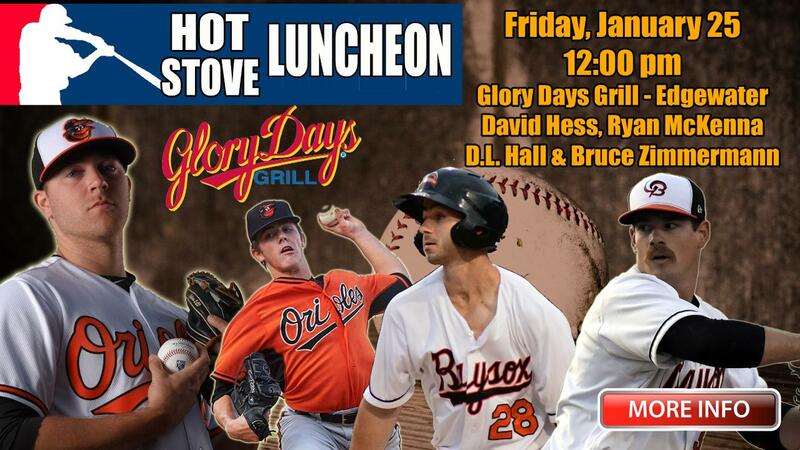 BOWIE, Md - The Bowie Baysox invite all fans to the fourth annual Hot Stove Luncheon on Friday, Jan. 25, from 12-1 p.m. at Glory Days Grill in Edgewater. McKenna joined the Baysox on June 21 after torching the Carolina League with Class-A Advanced Frederick. The outfielder hit .377 with the Keys (an overall OPS of 1.023) with 28 extra-base hits and 37 RBI in the season's first half, earning both a Midseason and Postseason All-Star selection. An organizational All-Star for the Orioles, McKenna also was named a 2018 Rising Star in the Arizona Fall League with the Glendale Desert Dogs. A product of Towson's Loyola Blakefield, Zimmermann came to the Orioles organization as part of a trade with the Atlanta Braves for RHPs Kevin Gausman and Darren O'Day. Assigned to the Baysox after the July 31 deal, the lefty allowed 12 earned runs and struck out 16 batters in 21.1 innings.